In 1651, the directors of the Dutch East India Company (V.O.C.) decided to establish, at the Cape, a half-way house on the sea route from Holland to the VOC’s possessions in the East. Jan van Riebeeck was appointed to command the proposed settlement. The three ships, Dromedaris of about 200 tons, the much smaller Reijger and a yacht, Goede Hoop, of about 40 tons, sailed from Texel on Christmas Eve, 1651. They carried van Riebeeck and his family, and a company of 80 men, who were to remain at the Cape, together with all their needs. The voyage was remarkably brief for that period, taking only three-and-a-half months, and the small fleet arrived in Table Bay and dropped anchor on 6th April 1652. Despite many hardships and difficulties, van Riebeeck persevered against all odds and the small settlement took shape. A fort and other accommodation were built, vegetable gardens were laid out and herds of cattle and sheep were built up by barter with the indigenous Khoikhoi. We are most fortunate that van Riebeeck kept a detailed journal, the original of which is lodged in the Cape Archives. This was, of course, a requirement of the VOC. It comprises about 2500 pages, and is written in old Gothic- Netherlands handwriting. It was, with great difficulty, translated into English and the text researched and edited by Professor H.B. Thom, who prepared the footnotes. (A.A Balkema for the Van Riebeeck Society, Cape Town and Amsterdam 1952-1958. 3 vols). By 1657, van Riebeeck had persuaded the Directors of the VOC to allow him to grant to some of the Company’s servants land along or in the vicinity of the Liesbeek River. Known as free burghers, they were soon actively farming there under van Riebeeck’s strict control. So it can be truly said that the colonisation of South Africa by people from Europe started in what is today Bishopscourt in close proximity to the house in which Archbishop Thabo Makgoba and all of his predecessors have lived. Professor Thom notes that Pieter Visagie was the ancestor of the Visagie family in South Africa. A little known fact about the Liesbeek River is that its fish were an important source of food for the free burghers in 1657 and subsequently. *Prof. Thom notes that water plants = ‘Lies’ and the Dutch word ‘beek’ = brook. Hence the name of the Liesbeek. A chart of the free burgher settlement as at 1658 can be found here. On 21st August 1658 van Riebeeck visited all of the freemen, and in addition to offering each of them a number of cows, he also offered “as many vines also as each wished to plant in his lands or against his house.” One or two took up the offer to plant against the house, but none was willing to plant vines on their lands. Of Bishopscourt, the SESA records this: “Official residence of the Anglican archbishops of Cape Town. It was purchased in 1851 by Robert Gray, first bishop of Cape Town, who had leased the property since 1848. 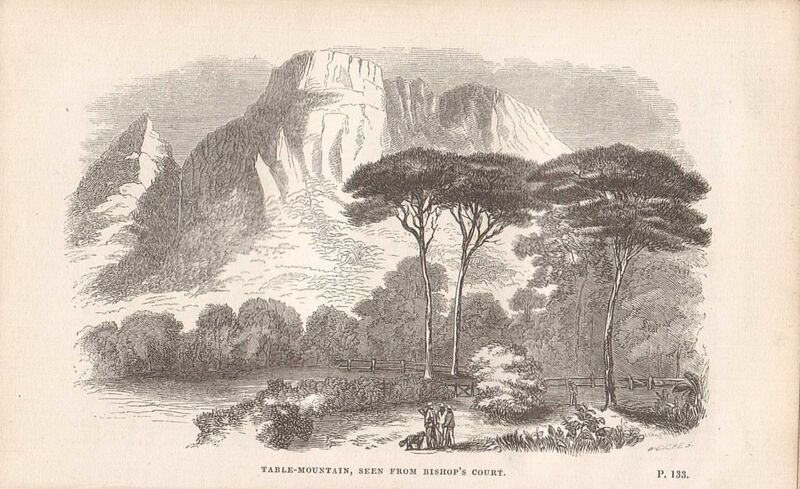 The estate, comprising 213 acres, stretching from the banks of the Liesbeek to Wynberg Hill, was granted by the Dutch East India Company to Jan van Riebeeck, who called it Bosheuvel. He planted a hedge of wild almond trees in 1660 to mark its top boundary, and this….has been proclaimed a historical monument. The estate changed hands several times in the 18th century, and in 1783 the purchase price increased from 400 pounds to 2,267 pounds, which probably indicates the erection of the present house with cottages and slave quarters. In 1805 it was purchased by Honoratus Maynier, whose tomb is on the estate. He changed the name to Protea, and after his death it was occupied by Sir Lowry Cole in the 1830’s.” [Governor of the Cape Colony, 1828-1833, supervised the abolition of slavery].